I want to win a week in one of your Tuscany villas!, well after all who wouldn't. Tuscany is the home of many of Italys greatest foods and wines, not to mention its breathetaking views and architecture. Any region that lists ingredients such as the white truffles of San Miniato, the extra virgin olive oils of Gaiole and Florance, the magnificent Chianina beef cattle (the essential ingredient of a good Bistecca alla Fiorentina), the divine wines of Chianti and all the other wonderful ingredients and regional products available in this breathetakingly beautiful part of Italy, it would be an honour to spend the week there, discovering at first hand what makes Tuscany on of Italy's true gastronomic destinations, and probably never stop eating. First make the pasta dough. Sieve the flour and salt out onto a clean work surface then make a well in the centre. Lightly beat the egg yolks together then pour into the well in the centre of the flour. Using your fingers, in a circular motion, gradually bring the flour into the egg yolks mixing together well to form a dough. Good pasta dough should be elastic and not sticky. Knead the dough for five minutes and then place in a bowl covered with cling film and leave in the fridge for at least an hour, but overnight is better, to rest. When you are ready to make the ravioli, remove the rested pasta dough from the fridge and allow it to steadily warm back up. While you waiting for your pasta dough, make your filling. Rinse the spinach and put in a saucepan. Cover and cook for about 5 minutes until wilted and softened then place in a colander to drain. 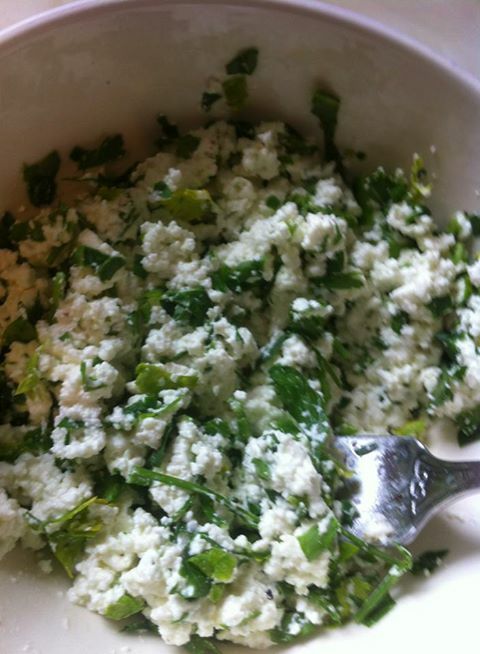 Squeeze as much water out of the spinach as you can then chop finely. Place your ricotta into a bowl and mush up with a fork then add the chopped spinach, egg and lemon juice and mix well together. Season with freshly grated nutmeg, salt and pepper. Leave to rest in fridge. Set up your pasta machine. On a work surface , divide your pasta dough into four, then flatten them out slightly by hand. Run the pasta dough through your pasta machine on its widest setting, run it through three times to prove the dough, before reducing the pasta machine settings and running the dough through once on each setting till you have a long sheet of smooth, velvety pasta dough. Repeat this with the other three pieces of pasta dough starting on the widest setting again each time. Lay your lengths of pasta out on the work top and trim them till you have four long rectangles of dough about 4 inches wide. Then get your filling mix from the fridge. 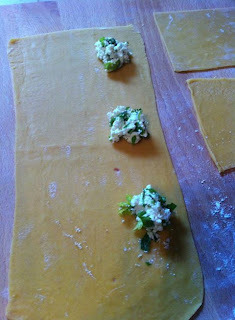 Shape small balls of the spinach/ricotta filling and place them on the pasta strips 1 inch from the edge and about 2 inches apart. Moisten the edges of the pasta dough with a little beaten egg then fold the dough over towards you so the filling is covered by the pasta dough and the front edges lined up together. Press the pasta sheets together around the filling ensuring there is no air trapped, as this will cause your ravioli to split during cooking, sealing firmly around the filling and edges. Use a serrated wheel cutter to trim the horizontal edge then cut the individual ravioli out about an half an inch on each side of the filling. Press around the edges of each ravioli just to make sure they are sealed and trim again with the serrated wheel cutter if needed. Repeat with the other three sheets of pasta dough. Rest your ravioli in the fridge till needed. When your ready to eat, take your ravioli from the fridge to let it warm up slightly, if you try to cook it straight from chilled you will get a chewy texture to your pasta, if it is room temperature this tends not to happen. Then start making your tomato sauce. Heat a glug of olive oil in a large flat-bottomed pan over medium heat. Add the carrot, celery, onion and garlic and cook until softened but not coloured, about 5 minutes. Add the tinned tomatoes and the thyme then simmer until the sauce has thickened, around 20 to 25 minutes, stirring occasionally. When your sauce is almost ready, bring a pan of water to a rolling boil then add a couple of good pinches of salt. Drop your ravioli into the water and let cook, this should take no more than 4-6 minutes for al dente pasta, they should float to the surface. 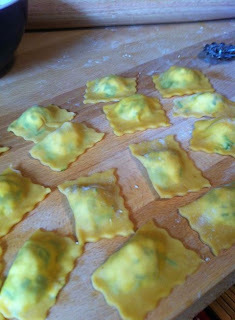 To plate up, remove your cooked ravioli from the boiling water and layer 10 -15 of them across the bottom of a plate. Dress the ravioli with spoonfuls of your tomato sauce then sprinkle with the freshly chopped flat-leaf parsley and plenty of freshly grated Parmesan cheese, then finish off with a good drizzle of Tuscan extra-virgin olive oil.